Product information "ULINKplus debug adapter"
consumption using its outstanding power measurement technology. - download programs to your target hardware. - examine memory and registers. - single-step through programs and insert multiple breakpoints. - run programs in real-time. - connect to running targets (hot-plugging). ◾Data and event trace for Arm Cortex-M up to 50 Mbit/s. to interact with the target under test or to control automated test stands. automatically updated and displayed. Also, the results from the power measurement are shown. 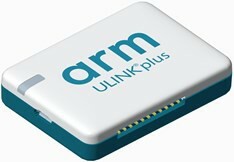 Related links to "ULINKplus debug adapter"
Customer evaluation for "ULINKplus debug adapter"